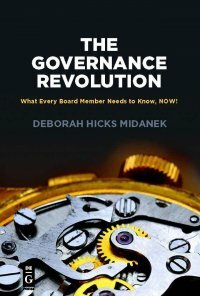 Book Title: The Governance Revolution: What Every Board Member Needs to Know, Now! The Governance Revolution, the fight for control of corporate wealth we are now engaged in, requires boards of directors to stand and deliver. Read this book from a seasoned independent director and turnaround executive for the how to, and the history. Deborah is a multi board director, a veteran of Wall Street, a serial entrepreneur, and an inveterate problem solver. She loves to read and to write, and to help people and organizations and herself become better. A New Yorker living in Mississippi, she has embarked on a downtown turnaround.